Floating is a practice. Just like you wouldn’t meditate once and expect to be a master, or begin a new exercise routine and expect to meet your goals overnight, floating is a journey. It is the antithesis of all the modern day addiction to FOMO and fast fixes. Floating encourages us to step into the deep places of ourselves. If you are looking for a change in your life and are truly curious about how floating can help you, I highly recommend starting out with several floats close together while your body adjusts to the unique environment of the float tank. In the book Tools of Titans Engle suggests starting with “2 to 3 floats inside of a month.” Engle has seen “Anxiety, insomnia and mental chattering … be significantly improved anywhere between 3 and 7 sessions. With the Introduction to Floating three float series, you can float once a week for three weeks for a very reasonable cost. Or for a more immersive experience, float three days in a row. No matter what float schedule you choose, consistency is what matters in making floating work for you. Setting a float schedule from there is an intentional process to be tweaked and honed as you become more aware of how frequently you need the tank. If you are living a high pressured lifestyle and taming stress is a constant struggle, your floating schedule may be more frequent. An athlete or weekend warrior may increase floating time when approaching a competition, or recovering from an event. A pregnant mama may enjoy more time for zenful floats before her baby enters the world and then come for a monthly float to catch up on rest once baby is here. As your practice develops you’ll begin to see what works for you. It’s a process. And no matter how clichéd it is, the journey is where your answer lies. How often are others floating? Glenn Perry and his wife Lee along with Dr. John Lilly created the first commercial float tank over 50 years ago. I can’t imagine the hours he has spent in the float tank over the years, so when he speaks about a personal floating practice, I listen! A few years ago, he issued a challenge if you float everyday for 2 weeks, your life will change." This intense floating schedule is not easy, but does seem to provide some deep introspection and many people have taken this missive, expanded upon it and shared their insights. The owners of Float Oasis in Canada, both floated for 21 days straight. Both Taylor and Tyson shared their experiences and insights from their time in the tank. And if 21 days of floating isn't enough, 31 was an experience that brought this floater closer to being who she wants to be. A pregnant mama writes a blog about her frequent float and time in the tank during her pregnancy. Leah talks about looking forward to her time in the tank where she could find comfort and have time with her unborn child in their own quiet happy place. 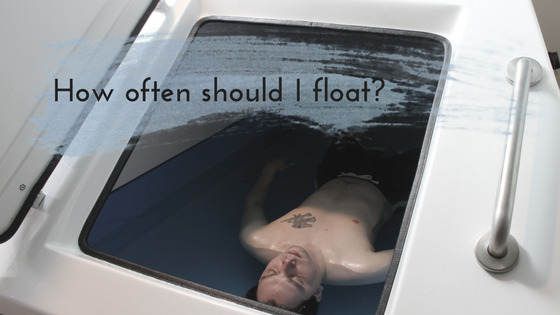 While the question of how often to float is probably the most frequently asked, it is often followed up with the question of how often do we float here at Float Nashville. Each member of our Float Nashville team is passionate about floating and the tank. While we are all frequent floaters, our float schedules look very different. As Jessyka has written before, she floats for migraine and pain management. She floats about once every two weeks, but floats more frequently when weather changes cause more frequent pain issues. Daisica does deep work in the tank and is known for her many float stints floating many times a week or even daily for days or weeks in a row when she is working on deep personal issues. Mark floats for stress, pain issues and will often do multiple short floats through the more stressful weeks. Over the years, my reasons for floating have changed and so have my floating habits. I float for stress, clarity of mind and to catch up on sleep when my mind or body won’t let me catch a full night in bed. These days I rarely do more than once a week, but last year while my Grandmother took ill and passed away soon after, floating became a soothing balm and the tank a solace while I grieved. Float schedules are never one size fits all, but a regular routine reaps you positive effects. Ultimately, the frequency is personal preference. Want to get started on your float practice? You can book an appointment online right now, or call us at (615) 567-7222. Memberships and series help to make a regular practice affordable.